"The Blackout Caper" is the 100th Mandrake Sunday story. The story was written by Lee Falk and drawn by Fred Fredericks. A mysterious doctor gather gangster chiefs from several cities, offering them two hours complete darkness for 500 miles in every direction -if they pay him 2 millions in cash. During the two hours blackout it was chaos and crimes. But strangly during the blackout the generators kept working. Was the blackout a cover for stealing the power, if so - why ? Doctor Zed, inventor of a thermonuclar reactor. And a mad scientist. Dudley, works for dr. Zed. Goat Island, formerly state hospital, now hide out for dr. Zed. 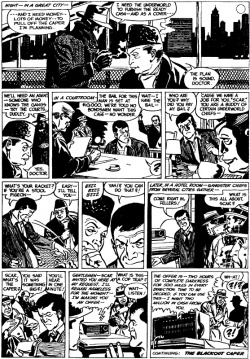 The story title is from the strip of January 1st, 1967 (Continued: The Blackout Caper). On tv, a Phantom movie. This page was last edited on 12 April 2019, at 20:07.